The Voting Rights Act of 1965, which was established to provide minorities equal access to voting polls is now being challenged in the Supreme Court–aiming to eliminate a provision that may do more harm than good. 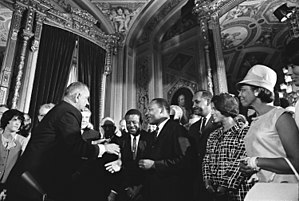 On March 1st 2013, the Supreme Court of the United States welcomed oral arguments on the validity and constitutionality of the fifth provision of the Voting Rights Act of 1965, which was challenged under the case name, Shelby County Al. v. Holder. The point at issue is whether to strike down or preserve the Fifth Provision under the Voting Rights Act–a provision which states that “parts or all of 16 states” must receive clearance from the Justice Department (or a court) before changing voting requirements or redrawing election districts. The states that were included in this provision happen to be all southern states. One state in particular that vehemently opposed this provision was none other than Alabama–the bedrock of the civil rights movement. The topic of discussion was not so much on racial discrimination [which Conservative Justice Antonin did a fine job of skewing when he said that Provision Five is a “racial entitlement”] but more on the basis of data dispute; federal intrusion (over states); and rapid change in demographics. In other words, they were making excuses for allowing the courts to not seek federal clearance before changing the voting requirements or redistricting. The odd ball in all of this is how Shelby County of Alabama, the plaintiff that attacking this provision, experienced no significant change in demographics OR had no statewide black officials. There are Nine court justices that serve the Supreme Court of the United States; and more than half of them agree of striking down this provision. If they strike down this “just” law, then the words of Martin Luther King Jr. will still stand: “injustice anywhere is a threat to justice everywhere.” And the law of the land will be painted in the color of injustice for us all. Update: Provision 5 of the Voting Rights Act has been struck down by the Supreme Court in Spring of 2013.